We love Festo because every year they invest an entirely appropriate amount of time and money into bio-inspired robots that are totally cool and very functional but have limited usefulness. More often than not, it seems like Festo is able to take some of what it learns from designing and constructing these things and create practical new revenue-generating products. Which is good for them, and means they’ll keep making cool stuff. Over the last few years, we’ve met ants, butterflies, flying jellyfish and penguins, kangaroos, seagulls, and much more. Festo has just announced its two newest bionic learning network robots—one is a very convincing flying fox, and the other is a walking, tumbling robot inspired by a Saharan spider. The model’s flying membrane is wafer-thin and ultralight whilst also robust. It consists of two airtight films and a knitted elastane fabric, which are welded together at approximately 45,000 points. Due to its elasticity, it stays almost uncreased, even when the wings are retracted. The fabric’s honeycomb structure prevents small cracks in the flying membrane from getting bigger. 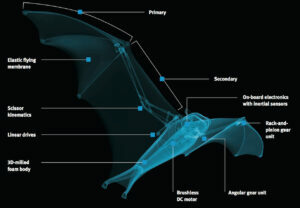 This means that the BionicFlyingFox can continue flying even if the fabric sustains minor damage. The wing is separated into primary and secondary control surfaces which are mechanically coupled together—on the upstroke, the primary folds in toward the secondary and extends back out again on the downstroke. Small motors in the body can adjust each wing separately, while a larger brushless dc motor does the flapping. The robot is autonomous, sort of, in that it flies by itself but relies on a ground station for camera-based localization, and all of the computing is off-board. 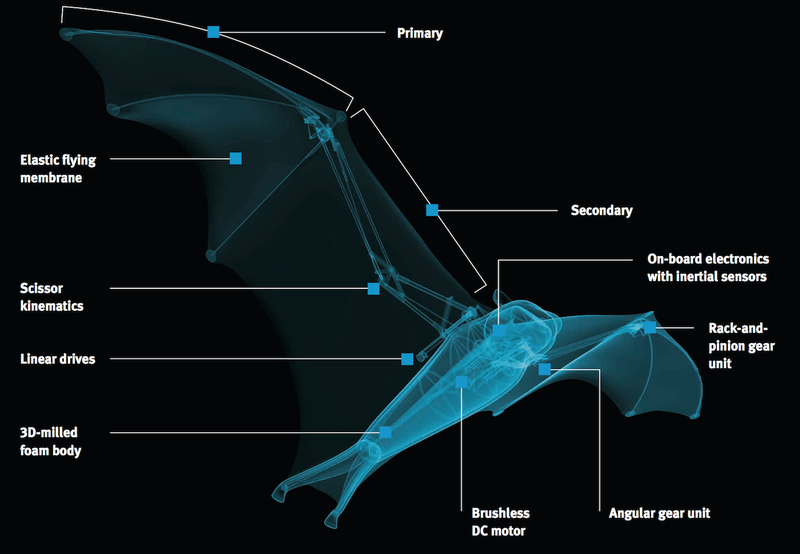 Festo uses machine learning to optimize the BionicFlyingFox’s flight behavior, such that every time it performs a maneuver, it gets just a little bit better. I’m not sure it’ll ever get good enough to stick an upside-down landing, though. Like its biological model, the BionicWheelBot has eight legs, which help it to both walk and roll. They are controlled by a total of 15 small motors, which fit in the knee joints and body. There are also 14 automatic-locking worm gear units that ensure that the spider only has to use energy when moving its legs—not, however, to keep its body upright when standing still. In rolling mode, the BionicWheelBot does a somersault with its whole body, just like the real flic-flac spider. Thanks to the integrated inertial sensor, it always knows what position it is in and when it has to push off again. It, too, is therefore much faster when rolling than walking and can even overcome inclines of up to five per cent uphill. In the BionicWorkplace, the bionic robot arm works together with numerous assistance systems and peripheral devices, which are networked and communicate with each other. At the same time, artificial intelligence and machine learning methods turn the BionicWorkplace into a learning and anticipative system that continuously optimises itself. Getting young people interested in technology is one of the main aims of our Bionic Learning Network. The Bionics4Education project brings the world of bionics together with the education sector. The interactive education concept allows a variety of topics relating to bionics to be experienced in the classroom. It consists of a digital learning environment and a practical training kit, which the pupils can use to make bionic prototypes in a creative manner. The Bionics Kit, which in 2018 will be the first-ever bionics training kit to come onto the market in Germany and the USA, is aimed at pupils between 14 and 18 years old. The Bionics Kit gives young people the opportunity to solve problems using bionic methods in a creative and uncomplicated way – by building a bionic fish, a chameleon gripper or an elephant’s trunk with adaptive gripper with Fin Ray Effect®, for example. As the basic equipment, the case contains all the components necessary to get started. This includes conventional small servo motors, electronics components and plastic elements such as Fin Ray® structures. The pupils’ task is to then sensibly combine these inventively with materials chosen by themselves. Cable ties, sandbags, cardboard, foam rubber and many other things are suitable for this, enabling the pupils to design their own reusable models.